Add a "magical" look to your Santa beard. Make your eyebrows match your white beard. For a perfect and finished Santa Character. Mini wireless receiver and transmitter combo for back stage staff communication with a performer. Includes microphone and ear buds for a complete system. Mini wireless receiver for performer communication with back stage staff. Mini wireless transmitter for backstage staff communication with performers. 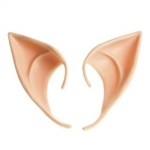 Personal Wireless 50-Watt (RMS) PA System Lightweight and comfortable elf ears add a special touch to Santa's helpers. Hand made, real leather phone pouch with embroidered Christmas tree design on outer flap.